EOS Poly Top Seal CSx-2O Stain is a specifically formulated Polysiloxane / Teflon system that protects concrete floors, driveways, and other structures against damage due to water penetration and staining due to oils, grease and a variety of solvents. EOS Poly Top Seal CSx-2O Stain provides long lasting protection against efflorescence (salt or lime leaching), staining due to atmospheric carbons, algae, mildew, metal, salts, chloride penetration, corrosion, most acids, acid rain, caustic's, dampness, and other water related damage. 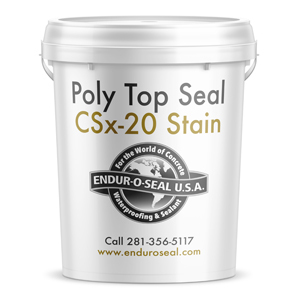 EOS Poly Top Seal CSx-2O Stain comes in 7 basic colors, Brick Oxide Red, White, Medium Gray, Charcoal and Black. Custom colors can be formulated for large orders.